Join us for another one of our popular workshops! Andy Lindberg of MeatME and Nate "Iggy" Brimmer of Giant's Belly Education provide three days of informative, hands-on instruction in traditional hog slaughter, butchering and processing, while Sean Emmons demonstrates and regales your senses with all manner of porky preparations from the kitchen. We are excited to be returning to Old Crow Ranch in Durham, Maine, who are breeding heritage Mangalitsa pigs, a Hungarian lard pig that produces magically marbled meat, a generous amount of creamy delicious fat and is ideal for salt curing. The first day of this workshop will showcase the humane harvest of pigs in the farmstead environment, and will provide hands-on training in traditional methods of outdoor scalding, scraping, dressing and chilling of the carcass. The next day we will break down the entire pig using a hybrid of traditional seam-butchery and modern american-style butchering techniques. The focus of this day is on thinking creatively about how we part out the animal, so that we maximize the specific cuts that we are most excited about, while finding creative uses for the less popular parts of the animal. 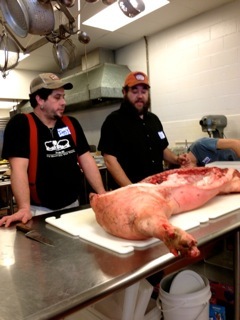 On Sunday we will begin the process of turning our fresh pork into delicious, smoked, dry-cured, and preserved products. We will demonstrate proper sausage making techniques as well as focus on the various value-added products that can be made from the odd-bits. In addition to demonstrating a variety of recipes and techniques, we will discuss the science of curing meat, and address basic food-safety concerns. Be prepared for a farm tour! Our hope is that we not only teach you techniques, but how to think and problem solve so that you can apply what you learn at the workshop in your home home, farm, or restaurant. Sean, our dear friend and talented chef, will be on hand to demonstrate and teach you how to utilize the odd bits. He will be working with any who are interested throughout the workshop to turn out an ongoing array of tasty treats for your gustatory pleasure! Sean's preparations draw from traditional recipes as well as creative innovations he has developed for these events to showcase the glory of all things pork. No part of the pig will be left unused! Lunch will be provided by Turtle Rock Farm, a small craft cannery and caterer out of Brunswick, Maine and will feature local and seasonal ingredients found in the area. Old Crow Ranch raises and sells Mangalitsa pigs. The Mangalitsa is a Hungarian heritage breed lard pig, that is ideal for curing. The extremely marbled meat has so much flavor it has been referred to as the "Kobe Beef" of pork. The firm, white lard that the Mangalitsa produces makes for far superior pastries and baked goods, the whole muscle cuts are perfect for curing and air-drying, and the nutritional benefits of Mangalitsa meat are higher than those of commercially bred pigs. This approach, wherein the choice of products produced is dependent on the micro-climates of each producer, for centuries yielded unique products in every village and farmstead, even when the same master recipe was followed. This is in direct opposition to the modern idea that every product can be made in every place. We believe strongly that the ubiquity of modern technology has made paupers of our palates. By spreading these skills throughout the grassroots we hope to rebuild a food system that is healthful, resilient, strongly place-defined, wildly diverse, and awesomely delicious. Option 1: $500 per person for all three days. Includes three days of intensive hands on education. A steady stream of house made charcuterie, odd bits, and special treats to sample that you will learn to make. Plus lunch and hot beverages served daily To register please follow the "Register Now" link at the bottom of the page. Option 2 (4 seats only): $1200 gets you a side of Mangalitsa pork, cut and wrapped during the class for you to take home, plus admission to the entire workshop and all amenities! Très awesome!​ To register please follow the "Register Now" link at the bottom of the page. For more information about the workshop, group and veteran's discounts please contact Iggy @ 207.415.4458 or meat@riseup.net. For information and specific questions about the side of Mangalitsa please contact Seren and Steve at Old Crow Ranch at Howdy@oldcrowranch.com. Check out MeatME and Giant's Belly Education and Old Crow Ranch on facebook. Register today and please share this site. See you there!